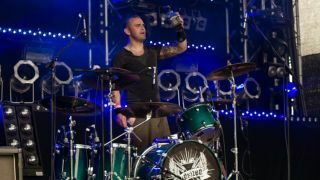 As drummer for touraholics like Jamie Lenman and Godsized, Dan Kavanagh knows a thing or two about life on the road. Here we start a new series in which Dan tells you all you need to know about surviving on the road. So like many before you, your band is going on the road. Well done, this is a huge step to becoming a successful musician. But what will it be like and how do you prepare? Hopefully some of the things I've learned along the way might help you out, as proper planning can make your life a whole lot easier. This is a list of things I wish I could've read ten years ago. You need to be ready for the price of your van, fuel, crossing charges, toll roads, merch, accommodation and food. That adds up fast. Make sure you've got what you need to be comfortable in the back of the van. A travel pillow is an absolute essential for long hauls, maybe also a blanket if it's winter and your van's drafty. I either like to sit up front so I can get a good look at the places I'm traveling through, or if I'm in the back I just like to zone out with my iPod. That's actually one of my favourite things in the world, and I save up records if there's a tour on the horizon. Get settled in, watch the world go by and get inspired by some new album on the way to a show - what could be better than that?! Have your passport on you, not in a bag in the back. It can be brutal out there. A lot of people, small spaces. Make sure you don't smell bad. If you smoke, have gum. If you're gonna party, you'd better have whatever you need to not be hungover the next day. Make sure you can get some sleep, odds are at least one of your chums will snore. Ear plugs are crucial, an eye mask is useful too. I aways take a sleeping bag on tour, especially if you're using band accommodation at venues. In Godsized, when we have a load of us in the same room it's known as a 'gorilla enclosure', as there are a bunch of apes snoring - once that starts, the only thing left for me is my iPod. I need something else to focus on so I can relax. Touring is tough on the body. You need to try and be sensible and not eat fast food every day, drink lots of water and get some fruit and vegetables in you when you can. This is tricky on the road, a detour to stock up at a supermarket is advisable if it's a long trip. Exercise if you're that way inclined. Resistance bands take up little space in the luggage and can turn a dressing room into a little gym, as well as being good for your health it's also good to just zone into something that isn't your gig for a little while each day. If you are a support band, don't expect them be moving any of their equipment from the stage, let alone sharing it. How well you deal with that, and how quickly you get off the stage should be a skill you get good at - it's one of the biggest factors in being recommended for more slots. Don't help yourself to other people's beer and rider - if it's spare and you're cool, you'll be invited to get stuck in. There's always a bit of sizing each other up at the start of a tour, be friendly and helpful and you'll make friends for life. Remember that the band you're opening up for have been where you are, and got the job done.